This is the second part of the tutorial, here I will show you how to do the Domino Server installation, read first part to see how to install Ubuntu Server. Before to start I just want to warn you that this is a practical guide without any warranty, it was written with the purpose to help system administrators, so I won't explain technical details neither the theory behind of them. 1.1 After you did the Ubuntu Server installation you are ready to connect to the system as "sysadmin" user. 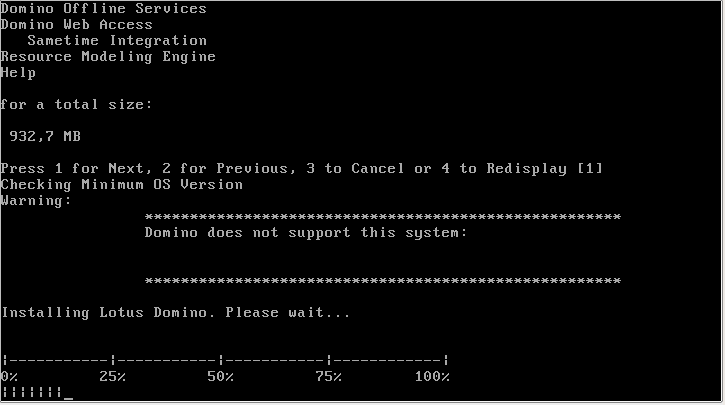 First you need to prepare the operating system otherwise Domino Server installation will fail. Domino Server needs a user and group to start its services, usually they are called "notes". 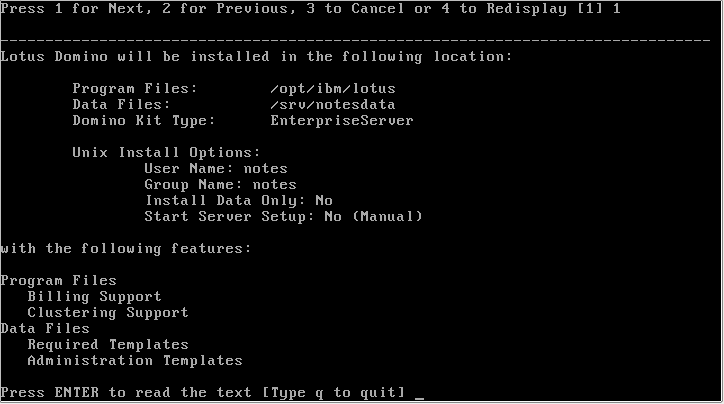 Create also "/srv/notesdata" directory where Domino will store its data. 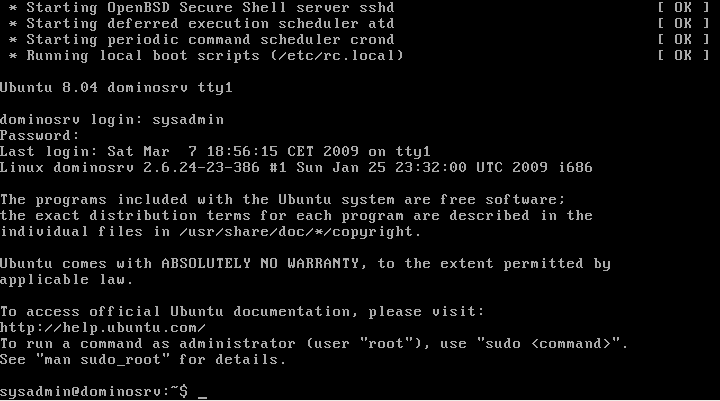 Since Ubuntu 6.10 the default system shell has changed from /bin/bash to /bin/dash, there are reason behind this important decision and if your interested you can read them here: https://wiki.ubuntu.com/DashAsBinSh. This means that to avoid troubles we have to change back the default shell to Bash. Another change it's about awk, Domino script is using /bin/gawk instead of a generic /bin/awk while Ubuntu has /bin/mawk, we can fix it with another symbolic link. 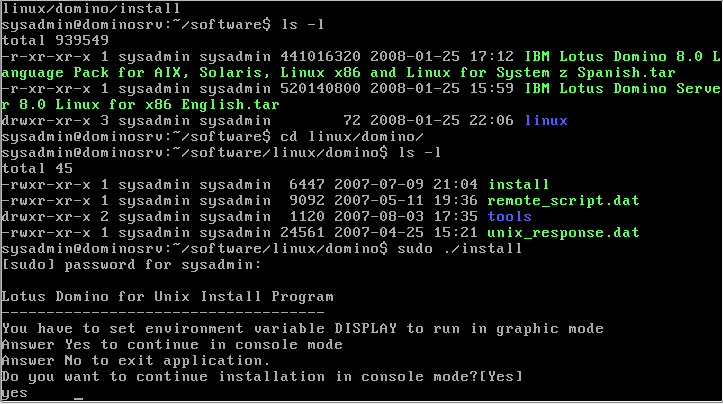 Download Domino's installation tarball directly from IBM website and copy them on a CD, so you can transfer them on the server. Note: if your're not used to write commands I just want to remind you that there is no need to write a such long file name, just type the first letter I then hit TAB key. 3.4 Installer will warn you that it cannot run in graphic mode, just answer yes to continue in console mode. This is correct. Ubuntu Server doesn't have any GUI and this is the way that should be as there is no need to run any graphical program on Unix/Linux servers, also we avoid some security risks. As I said in the first part of this tutorial Domino Server installation is expecting to install its data directory under /local/notesdata but it doesn't follow the FHS standard, so I prefer to use /srv/notesdata directory. The most important thing here is to choose the right option for "Start Server Setup". We cannot do a local setup because there's no GUI, so can you either choose "Remote" or "Manual", if you are going to install a language pack is have to use the second one. 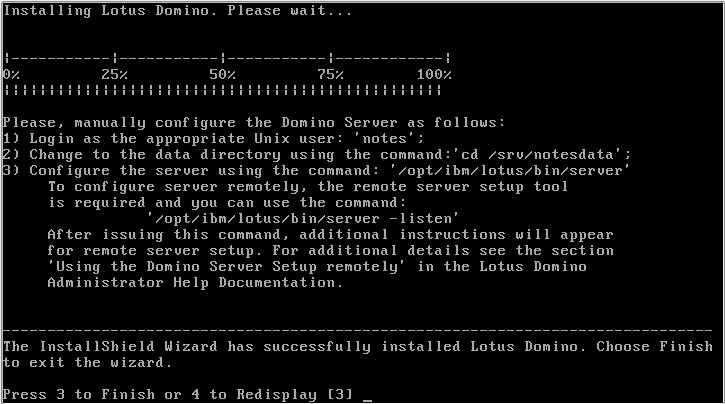 3.5 Domino installation starts and the installer is warning you that Ubuntu system is not supported, we can ignore it and hope that IBM will change its mind in the near future. 3.6 When installation is finished it will provide us instructions to run a Remote Setup. If you need a to install a Domino Language Pack now it's time to do it, here it is an example for Spanish language. 4.1 Untar the Language Pack tarball. 5.1 Exit from the console and login back as "notes" user, then start Domino in listen mode. Here I used the pwd command to be sure that we are inside the /srv/notesdata directory. 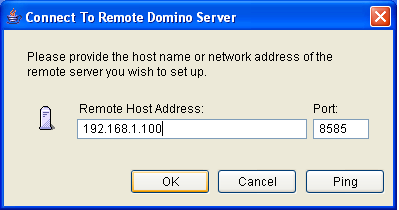 5.2 You can configure Domino Server using "Remote Server Setup" from a client pc with Domino Administrator. 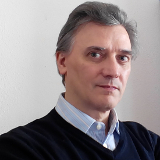 We need to do this from a Windows PC, I know that we want to do everything from Linux but IBM didn't release yet a Linux version of the Domino Administrator. 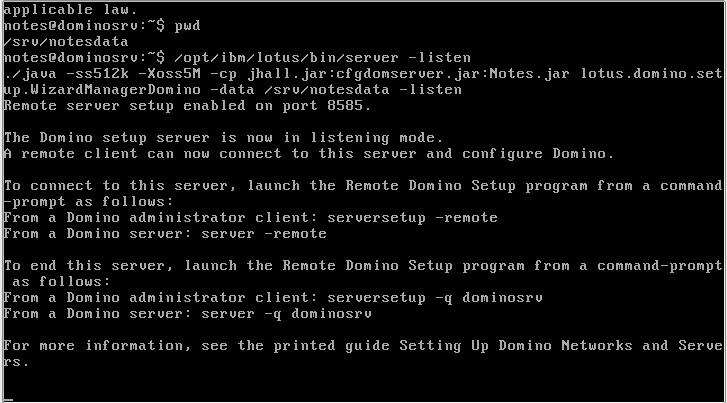 5.3 Continue with Domino remote setup, this is the usual configuration so I am not going into its details. 6.2 Edit the file with vi or nano. You need to check that variables between line 49 and 60 meet your system configuration. 48 # Remember to adapt everyting to your installation! 49 # The values below work only on default installations! $ update-rc.d domino start 99 2 3 4 5 . stop 01 0 1 6 . 6.8 Domino will now startup automatically and you can connect to it from any Lotus Notes client. If you want to check Domino startup console messages hit ALT-F12 keys. That's end the Domino Server installation, now you can install a Lotus Notes 8.5 client on your Ubuntu Desktop which is a simple task now that IBM is providing .deb files for Debian and Ubuntu, check it out here.